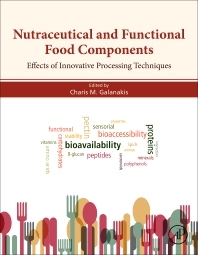 Nutraceutical and Functional Food Components: Effects of Innovative Processing Techniques presents the latest information on the chemistry, biochemistry, toxicology, health effects, and nutrition characteristics of food components and the recent trends and practices that the food industry (e.g. the implementation of non-thermal technologies, nanoencapsulation, new extraction techniques, and new sources, like by-products, etc.) has adopted. This book fills the gap in knowledge by denoting the impact of recent food industry advances in different parameters of food components (e.g. nutritional value, physical and chemical properties, bioavailability and bioaccessibility characteristics) and final products (e.g. applications, shelf-life, sensory characteristics). Dr. Galanakis is a dynamic and interdisciplinary scientist with a fast-expanding work that balances between food and environment, industry and academia. His research targets mainly the separation and recovery of functional macro- and micro-molecules from different food by-products, as well as their implementation as additives in food and other products. He is the research & innovation director of Galanakis Laboratories (Chania, Greece) and the coordinator of Food Waste Recovery Group (SIG5) of ISEKI Food Association (Vienna, Austria). He serves as an editorial board member and subject editor of Food and Bioproducts Processing and Food Research International, whereas he has published dozens research articles, reviews, monographs and conference proceedings. He has edited 4 books entitled "Food Waste Recovery" (Academic Press, 2015), "Innovation Strategies in the Food Industry" (Academic Press, 2016), “Nutraceutical and Functional Food Components” (Academic Press, 2017) and “Olive Mill Waste” (Academic Press, 2017). Follow Dr. Galanakis via Twitter, LinkedIn, ResearchGate or Blog. Join his open discussion forums at the Food Waste Recovery & Innovation 2020 LinkedIn group or the Food Waste Recovery FB Page.